In this phenomenal play, now at Profile Theatre, actor Seth Rue takes on the task of showing the spectrum of the “American character” as he portrays 26 different people offering their diverging points of view. It is a dauntless task, and yet Rue is more than up to it in a tour de force performance that left his opening night audience on the edge of their seats. In August, 1991, in the racially divided neighborhood of Crown Heights, a car driven by a Jewish man ran a red light, veered onto a sidewalk, and killed a 7-year-old Caribbean-American boy who was learning to ride a bicycle. In the critical time following the accident, emergency response was slow to arrive. Angered onlookers accused responders of not seeing to the boy in favor of the Jewish motorist, the neighborhood exploded in violence, and later that night a Jewish student from Australia was stabbed near the scene and later died from his wounds. Seth Rue as African-American literary figure Ntozake Shange in Fires in the Mirror. Photo by David Kinder. 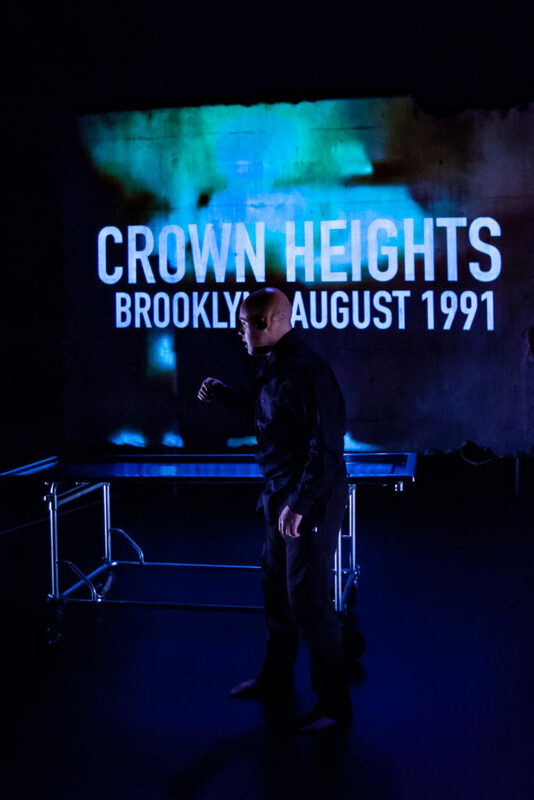 In the months following the riots, playwright Smith conducted dozens of interviews with religious leaders, Crown Heights residents, politicians, and artists. From them she crafted the 90-minute play consisting of the monologues of 26 of the people interviewed. The play opened in New York City in 1992, with Smith herself performing her play. On the Portland stage, Rue, directed by Bobby Bermea, embodies the identities of those interviewed, ranging from a Crown Heights Lubavitcher woman talking about wigs to the Rev. Al Sharpton, from a teenage girl of Haitian descent to Letty Cottin Pogrebin, one of the founding editors of Ms. magazine. Morphing from one character to the next with a change of hat, glasses, or a scarf, Rue’s every accent, every gesture, every expression conveys a unique human being different from the one before it, each invested in his or her community, offering views as to the meaning of the riots. Seth Rue as African-American playwright George C. Wolfe in Fires in the Mirror at Profile Theatre. David Kinder photo. This is an under-the-microscope look at a historic event told verbatim by those who had a stake in not only the tragedy, but in the social milieu surrounding it. Audience members will appreciate not only the scope of the fallout from this event and others like it, but how it has contributed to who we are today. In its 21st season, Profile Theatre usually focuses each season on an individual playwright. This year, and into 2019, it examines the plays of both Anna Deavere Smith and Lisa Kron. Fires in the Mirror‘s brief run ends October 21 at Profile Theatre in the Morrison Theatre at Portland Center Stage. It is an intense and thought-provoking piece for ages 15 and up. This sounds like an amazing piece of work. Thanks for sharing your review! I was grateful to see this amazing play and to witness the performance by Rue. I learned and felt so much because of the writing and his skills. Thanks for the review!